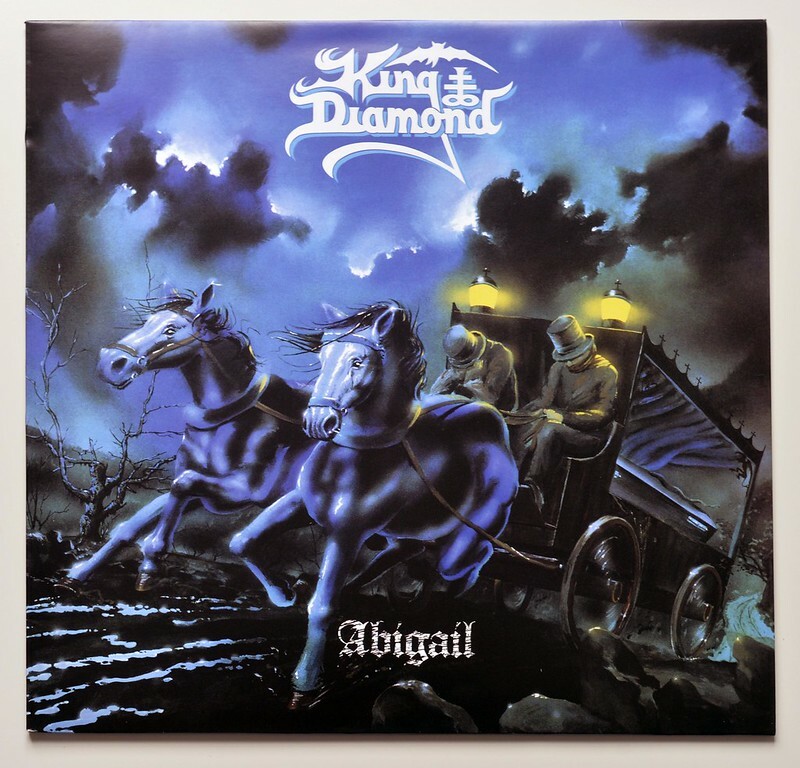 Beautiful High Quality Audiphile release of this "classic" King Diamond album. 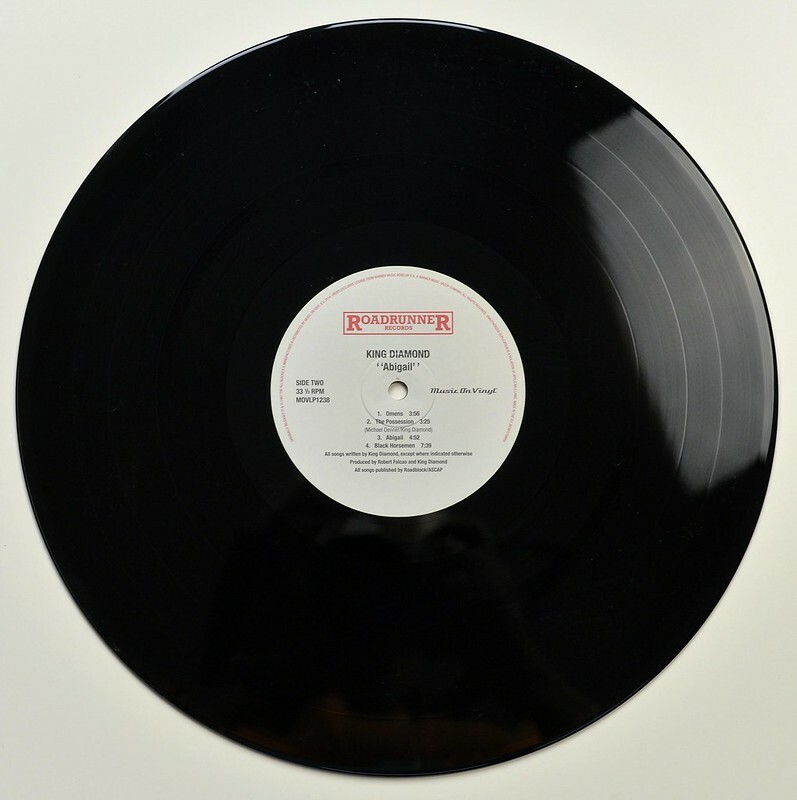 This album "KING DIAMOND - Abigail (Music On Vinyl)" includes the original custom made black insert with lyrics of all the songs performed. Robert Falcao Roberto Falcao is producer and sound engineer since the first King Diamond record "No Presents for Christmas" on later "King Diamond" albums, he is guest playing the keyboards. Thomas Holm started his career as art designer in the early 1980's and has done the album covers for bands like: Mercyful Fate, King Diamond, Spartan Warrior, Dark Heart. 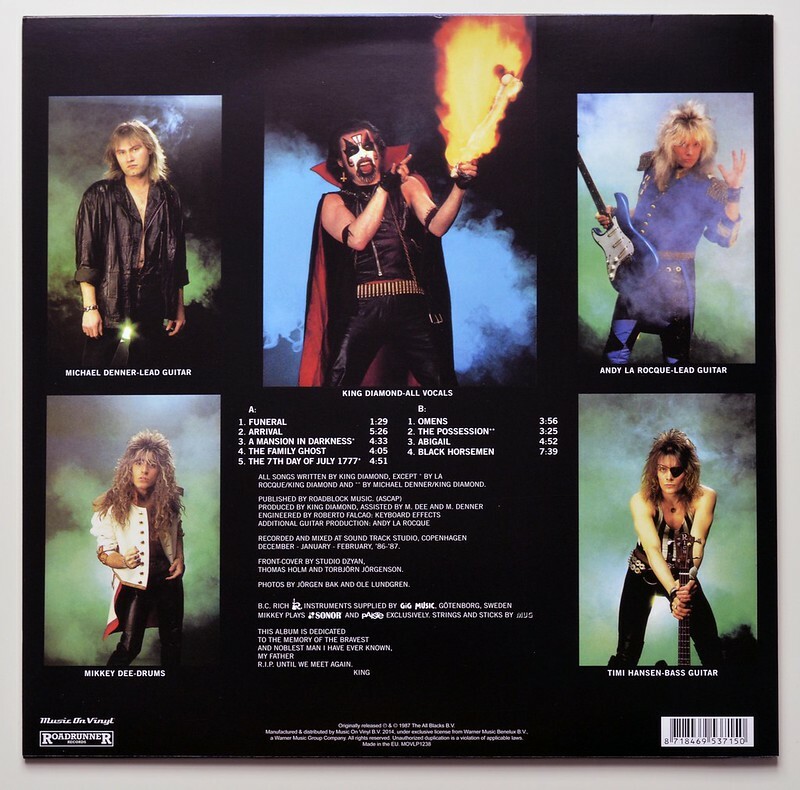 For the "King Diamond" and "Mercyful Fate" albums he has often been working together with "Thorbjorn Jorgensen". Thorbjorn Jorgensen a Swedish illustrator and graphic designer and member/founder of the Studio Dzyan in Malmö. Thorbjorn has been working on all the artwork for the albums of Mercyful Fate, King Diamond, S.P.O.C.K, Lord Belial and many others. For the "King Diamond" and "Mercyful Fate" albums he has often been working together with "Thomas Holm". Öle Ludgren - photographer for the "King Diamond" albums: Abigail, Them, and "Fatal Portrait". High Quality Photo of Album Front Cover "KING DIAMOND - Abigail (Music On Vinyl)"
Album Back Cover Photo of "KING DIAMOND - Abigail (Music On Vinyl)"
Kim Bendix Petersen better known by his stage name King Diamond , is a Danish heavy metal musician. As a vocalist, he is known for his extensive vocal range, in particular his usage of falsetto. He started his career in 1974 with a band called Brainstorm and has since performed with Black Rose, Brats, Danger Zone, Mercyful Fate and the eponymous King Diamond band. Michael Denner is a Danish heavy-metal guitarist. He is part of the heavy metal duo Denner/Shermann with Hank Shermann. Michael Denner plays guitar with Brats from 1979-1980, "Mercyful Fate" from 1981-1996 (with several interruptions. Anders Allhage mostly known under the alias: " Andy LaRocque " and is best known as guitarist with King Diamond. He started his musical career in the Swedish "Swedish Beauty" aka "Swedish Erotica" and E.F. Band he moved in 1985-1986 to play with the "King Diamond" band. Micael Kiriakos Delaoglou alias Mikkey Dee started his long career in 1985 with King Diamond, switched to Dokken in 1990, followed by Motorhead and Scorpions today. Timmi "Grabber" Hansen is a Danish bass player. He played in the Danish heavy metal band Mercyful Fate from 1981 to 1985 and from 1992 to 1993, and King Diamond from 1985 to 1987. 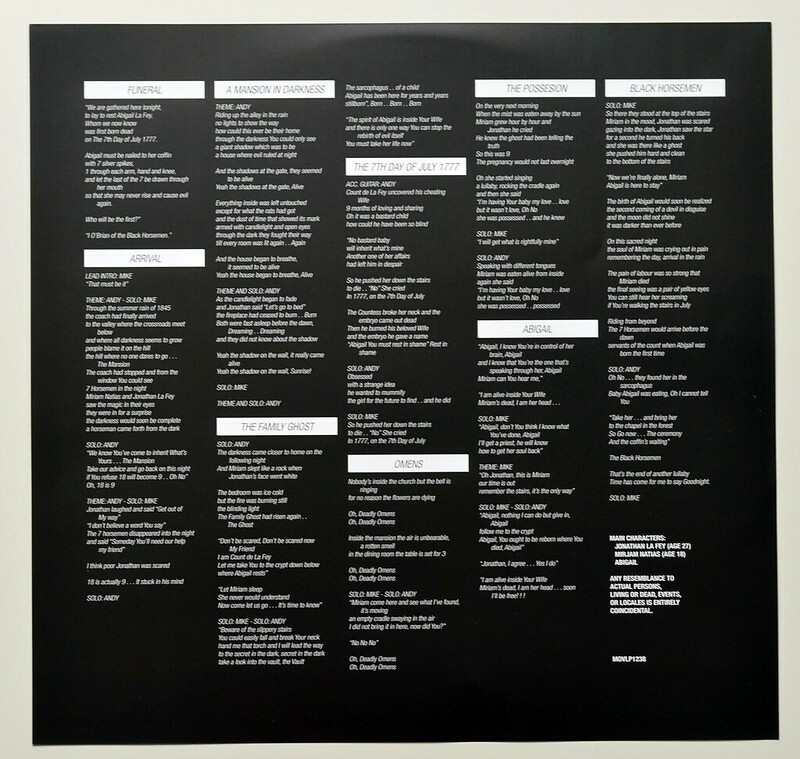 Complete Track-listing of the album "KING DIAMOND - Abigail (Music On Vinyl)"